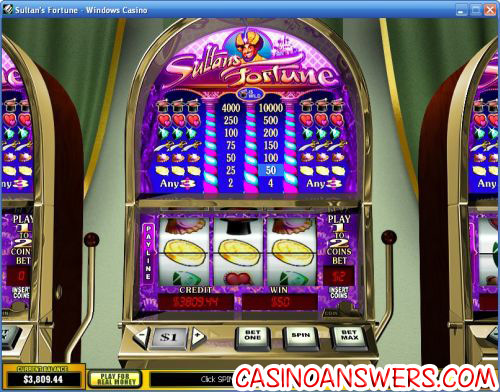 Sultans Fortune Classic Slot Guide & Review - Casino Answers! Sultan’s Fortune is a 3-reel, 1-line classic slot machine developed by Playtech, featuring a wild symbol. You can play the Sultan’s Fortune classic slot machine at Titan Casino and Bet365 Casino. The highest paying symbol in Sultan’s Fortune is the Top Hat symbol, three of which will pay out the 10,000 coin top jackpot. The Top Hat symbol is wild, thus it will substitute for all other symbols in Sultan’s Fortune. There are 7 winning combinations on the Sultan’s Fortune classic slot machine. The full payout schedule is as follows (1/2 coin payouts in parenthesis): any 3 symbols (2/4), 3 Gold Coin symbols (25/50), 3 Pearl symbols (50/100), 3 Sword symbols (75/150), 3 Gem symbols (100/200), 3 Heart symbols (250/500) and 3 Top Hat symbols (4000/10,000). The Sultan’s Fortune slot machine has an autoplay mode found in the game menu. You can set the number of spins to play automatically (up to 9999), the delay between spins, to stop on jackpot win, to stop if a single win is more than any value you enter, to stop when your overall win more than a value you can enter and to stop when your overall loss is more than any value you enter. You can stop the autoplay mode at any time. Sultan’s Fortune offers players a great top payout for a classic reel slot machine at 10,000X, in addition to many other reasonable payouts. Another great thing is that whenever you hit three symbols of any kind, you will receive a small payout. To play the Sultan’s Fortune classic slot game and hopefully win a fortune of your own, sign up and deposit today at Titan Casino! Are USA players able to play the Sultans Fortune classic slot for real money? Unfortunately, players from the United States of America are not allowed to play the Sultan’s Fortune slot machine for real money at this time. For a great selection of USA-friendly classic slots, video slots and other casino games, please visit Online Vegas Casino. How much can I win playing the Sultans Fortune slot machine? On the highest total bet of $10, you can win $50,000 if you hit three Magic Hat symbols on the Sultans Fortune classic slot. Is there a free Flash game of Sultans Fortune that I can play anywhere? Yes, Sultans Fortune is one of the many games offered at Titan Flash Casino and Bet365 Flash Casino for no-download play. You can play for free or play for real money in Instant Play mode. If you experience difficulties with the Instant Play Flash casino software, try downloading and installing the latest version of Adobe Flash Player. Where is the best place to play the Sultan’s Fortune slot machine? We recommend you play Sultan’s Fortune at Titan Casino, which offers a huge €4,000 welcome bonus and a whole lot more. For further details, you can read our review on Titan Casino.